Russia, Kazakhstan and Belarus have signed a declaration enforcing the Customs Code for the three countries, President Dmitry Medvedev said in Astana at a summit of the Eurasian Economic Community (EurAsEC). "A statement was signed on the enforcement of the Customs Code. In relations between the three countries it will be applied as of July 6 this year. In relations between the Russian Federation and Kazakhstan, as of July 1, 2010," the Russian leader said, Interfax writes. A lot is yet to be done on the way to the single economic space, he noted. But Medvedev expressed confidence that since the creation of the Customs Union is "an advantageous and interesting enterprise", the parties will manage to come to an agreement on all the issues. The presidents of the three states – members of the Customs Union – have charged the governments with working out a package of documents on the formation of the common free market zone by January 1, 2011. By the beginning of 2012, they should come into force, said Igor Shuvalov, Russia’s first deputy prime minister. Moscow is pleased that its co-operation with Minsk and Astana has entered “a phase of advanced integration,” said President Medvedev. “We will wait and see,” he added. Belarus’s participation in the union was not certain until thelast moment, especially since relations between Minsk and Moscow have chilled following the latest gas spat. Last week, Kazakhstan and Russia ratified a common customs regime, known as a customs codex, and agreed that customs duties between the two nations would be lifted as of July 1. However, on Saturday, Lukashenko announced that all the documents required for joining the union with neighbors had finally been ratified. Established in 2000, this year the EurAsEC marks its tenth birthday. 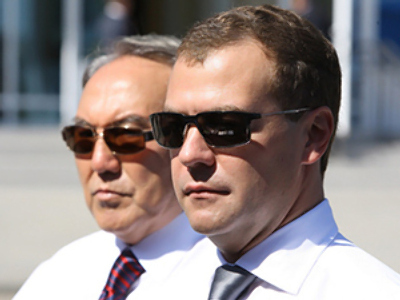 In terms of history, however, that period is not that long, Medvedev said. The Russian head of state suggested comparing “what has been happening in the EurAsEC and Customs Union to the integration in Europe,” Itar-Tass writes. “We are progressing faster,” he stated. “It does not mean that we are moving swiftly.” Despite some heated debates, Medvedev said, adding “We eventually come to agreements, as today’s summit has shown”. The Astana EurAsEC summit has generally been rather fruitful, as a host of agreements have been reached. The leaders of the member-states have also agreed on the status of the EurAsEC court. "I am happy that we have agreed on the court statute. It indicates that integration is entering its final phase because the court is needed when there are real relations," Medvedev told the media, cites Interfax. The host of the summit, Kazakh President Nursultan Nazarbayev, agreed that the step is important. He added that document “envisions the expansion of the court's terms of reference when trying cases within the Customs Union." The new statute will help regulate legal proceedings in connection with the creation of the customs union, he said. The main task of the EurAsEC court is to settle economic disputes between the member states and give explanations and decisions on the body’s documents. Meanwhile, Tajikistan and Kyrgyzstan are also mulling over the idea of joining the Customs Union. 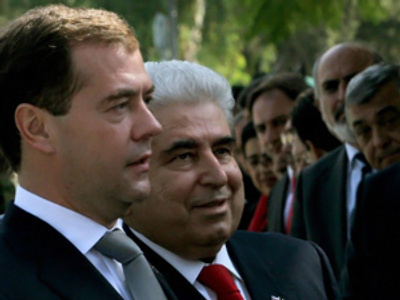 "We have been studying the matter very seriously," Tajik President Emomali Rakhmon said. Kyrgyzstan, as a member of the World Trade Organization, has set up a working group for studying the issue of the accession to the union “with account of advantages for the country", said Roza Otunbaeva. The Astana EurAsEC summit is the premiere for Otunbaeva on a big political stage. She was inaugurated as Kyrgyz president last Saturday, following months of unrest in the republic. Otunbaeva headed the interim government after an uprising in April in which then-President Kurmanbek Bakiyev was ousted. The treaty on the creation of the Eurasian Economic Community was signed on October 10, 2000 in Kazakhstan's capital of Astana. 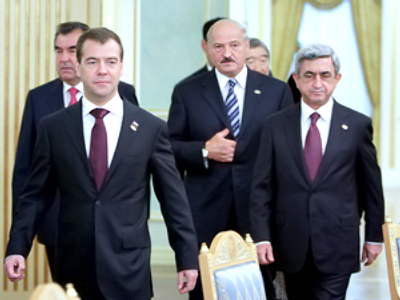 The organization is composed of Belarus, Kazakhstan, Kyrgyzstan, Russia, Tajikistan and Uzbekistan. The body’s 10th anniversary coincides with Nazarbayev’s birthday. He turns 70 on July 6. "Ten years after its establishment, we say with confidence that the EurAsEC is the most successful international structure on the post-Soviet space," the Kazakh president stated. “EurAsEC is younger than me,” he added. Carrying on with the joke, Belarusian president Lukashenko noted, “Don’t worry; you do not look worse than EurAsEC.” The compliment was accompanied with praise of Kazakhstan’s efforts in the integration process within the organization. “[Nazarbayev] has been the engine of all our relations within EurAsEC. It is not flattery,” Lukashenko added. Greetings from other heads of states have been flocking to Kazakhstan wishing Nazarbayev well for his birthday. The next meeting of the EurAsEC leaders is scheduled for December this year in Moscow.